2 tablets per day or as recommended by a physician. To be taken with food. BioActive JointCare is a preparation consisting of light blue tablets each containing 500 mg of glucosamine sulphate corresponding to 400 mg pure glucosamine, 400 mg chondroitin sulphate and 20 mg of vitamin C.
The daily intake of jointCare is a great way to provide your joints with some of the substances found in normal cartilage. The content of vitamin C supports your body and the biological processes that contribute to the mobility of your joints. The tablets are taken with a glass of water, preferably but not necessarily with a meal. The dosage is one tablet two times daily. You can also choose to take the whole day's ration at one time. Do not take double dose if you forget a dose, but continue with normal dosing. In the absence of adequate studies on whether glucosamine can be used by pregnant and lactating, BioActive JointCare is not recommended during the pregnancy and lactation period. Glucosamine is a small water soluble molecule (an amino-monosaccharide) that the body itself can produce. Glucosamine is included as a building block in the union of glycosaminoglycan and hyaluronic acid, which both contribute in the construction of joint cartilage. If you are allergic (hypersensitive) to glucosamine, one of the ingredients or to shellfish, do not take glucosamine as the active substance is derived from shellfish. Collagen is a cross-linked protein in human tissue. Like the iron mesh that reinforces concrete constructions, collagen provides elasticity and tensile strength, thereby offering useful support for e.g. collagen in joints. 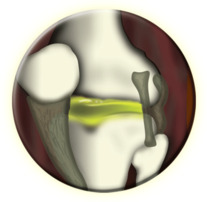 The cartilage in a young and healthy knee joint is intact so it can serve as a protective cushion that absorbs shock and impact. The best way to maintain healthy cartilage is by making sure to stimulate the joint by regular use. In fact, the compression and decompression of the cartilage tissue that happens when you use a joint is necessary to ensure that the supportive nutrients enter the cartilage. These nutrients serve as building blocks in the upkeep of strong and elastic cartilage. Healthy joints and cartilage are important for maintaining quality of life. The better your joints function, the easier it is for you to stay physically active and enjoy the different activities that help you stay youthful and fit.